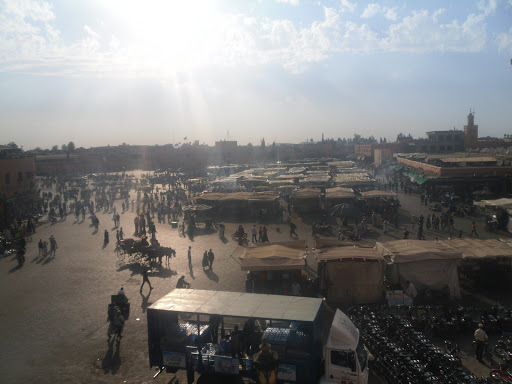 Described as the beating heart of Marrakech the Jemaa el-Fnaa is a mish mash of snake charmers, buzzing market stalls, performing monkeys and horse carriages mixed amongst a sea of people. After finishing our 4 hour descent from Neltner basecamp, Abi and I descended straight into Marrakech with blind enthusiasm. We dashed across roads where vehicles never stopped. 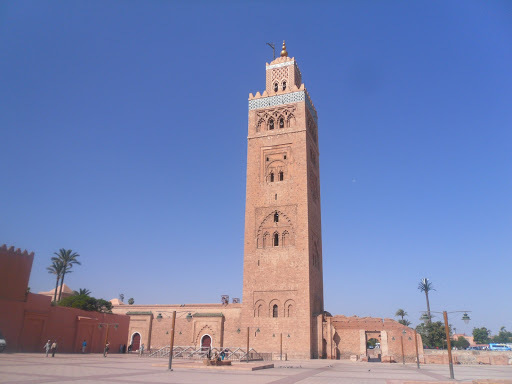 We absorbed the sights of horse drawn carriages and listened in curiosity to the call for prayers from Koutoubia Mosque. After many wrong turnings, we eventually reached the square within the Medina. “Am I walking in the road?” I ask Abi. “Nah, I think it’s a free for all here”. We flinch involuntarily as mopeds swerve around us and as bicycles cut through the crowds. It was a collusion of vehicles, people, market stalls and animals yet it all seemed to work out. We embraced the vibrancy of the square, until a lady strides directly to us with purpose. She leads us straight to her Henna stall, insisting that we look through her Henna album. She grabs Abi’s hand and immediately starts piping out a swirly pattern. “you pay what you want”, she asserts. “300” she demanded, after finishing my design. “300, 300!” she was relentless as we attempted to negotiate lower with little success. We eventually parted with the money, a little shamefaced at our poor skills of negotiation. 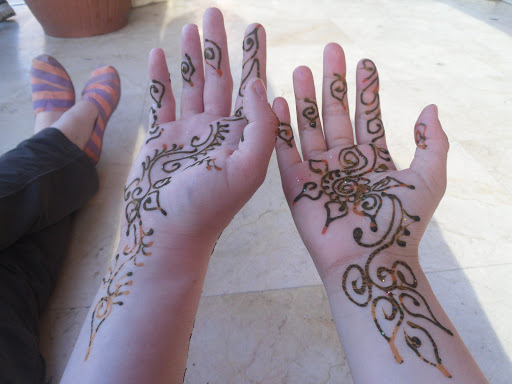 “Have this one as a gift” said the Henna Artist, probably pitying our measly attempt at paying a fair price. She inked a design for each of us on the palm of our hand, swirling the pattern down to the wrist. We smirked as we left, finding humour in the situation as opposed to bitterness. We wandered down a small side street, oblivious to the labyrinth of the souks that we were about to enter. 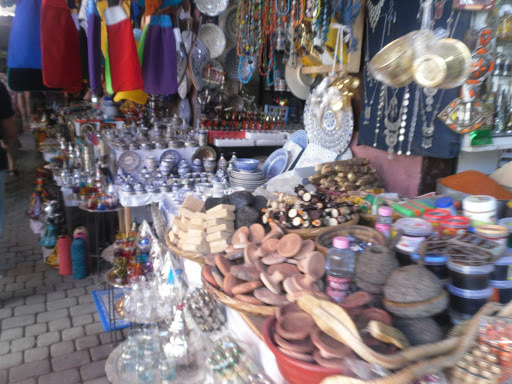 The souks were a melting pot of colour, winding alleys and Moroccan wares. We strolled down the narrow streets, dodging speeding mopeds and browsing through goods without revealing too much interest in order to avoid the shopkeeper’s insisting for a sale. 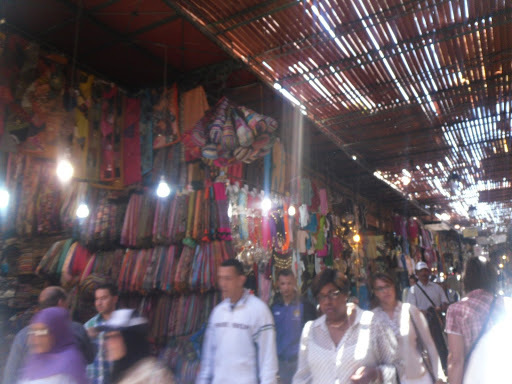 We descended further and deeper into the souks. “Are you canadian! ?” “Are you Japanese! ?” “Let me help you! !” “You are beautiful!” The path spiralled endlessly through sheltered space adorned with colourful scarves, silver teapots, bottles of spices and jewellery. After forty minutes of wandering, we started to give people the cold shoulder. It was very overwhelming having people shout at you/hit on you from left, right and centre: pointing at different directions to go, offering help and telling us that we were going the wrong way. We found our way out an hour later. We passed craftsmen shaping ironwares, a corridor of rainbow-like lamps and bulbs, and shoemakers pounding leather. It was sensory overload, yet it was unique and captivating. 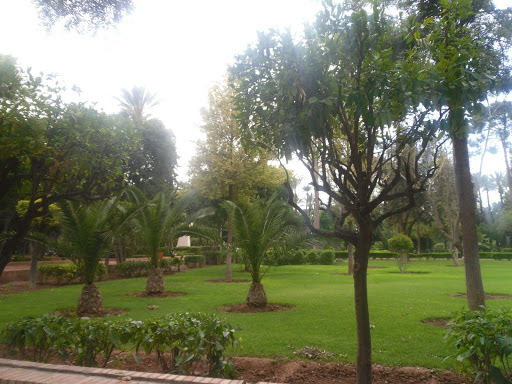 For our second day in Marrakech, we learnt to embrace the experience, but in small doses. After our walking tour, we took a breather in Foucault Square and Cyber Park, sitting amongst greenery away from the chaos of the square for re-energising. “Hi, I’m a lifeguard and we do aqua gym classes, which hotel are you staying at?” and I’m going to sit here and leer at you very indiscreetly. The park was a welcome break despite the odd occurrence here and there, as detailed above. There was a characteristic buzz of Moroccan youths singing, playing guitar and hanging out with friends. We soon descended back into the square, strolling down a quieter street and browsing through stalls. 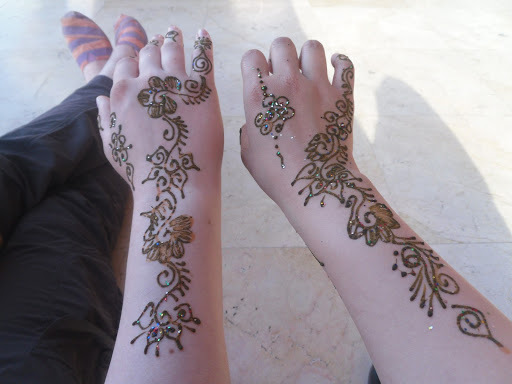 Abi brought some Henna paint after some light negotiation and I brought some Jasmine. On our way back, the shopkeeper yelled after us: “I have tea!! Come have some free tea with me! !” At first, we walked on then we glanced at each other, contemplating the offer. I nodded at Abi, as we headed back towards the shop, hoping that we made the right choice. He introduced himself as Yousef whilst boiling some mint tea on a portable gas stove. 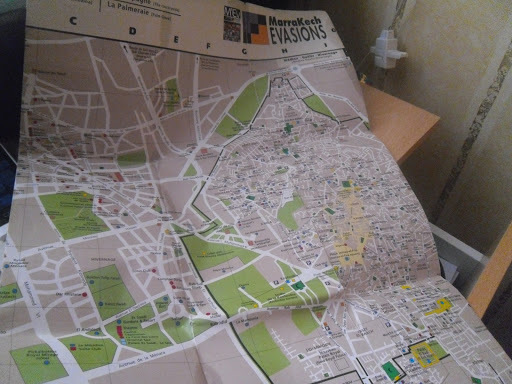 We conversed about family, Marrakech and about our hike in Mount Toubkal. He handed us tea in a small glass each, using the opportunity to show us his wares. He massaged rose oil and argan cream onto our forearms and hands, soothing our weather-beaten skin from the mountains. He dropped a small shard of eucalyptus in our tea: transforming the taste from minty to a strong vicks-like liquid which completely cleared the airways. Yousef proceeded to pull up a chair, asking us to sit on the same side as him. He gave us each a shoulder/arm/facial massage skillfully. We thanked him as we left the shop, where we purchased a Argan cream each. 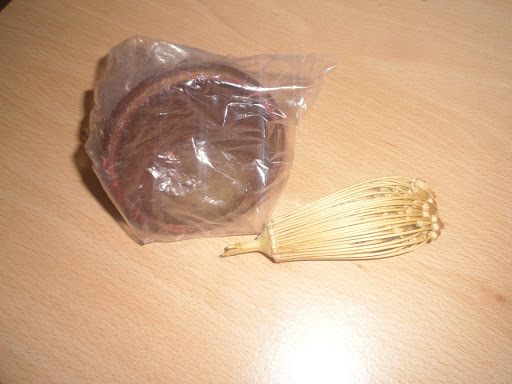 He presented us with a gift as we left: a toothpick brush and lip balm pot. He invited us out for dinner which we politely declined due to our final team meal for the evening. Overall, Marrakech was a crazy yet truly unique experience. Your senses go into overdrive and everything is of the unexpected. Take everything on board, descend into Marrakech with an open approach, take a breather now and then and embrace the city! Basically, do everything I didn’t do haha. 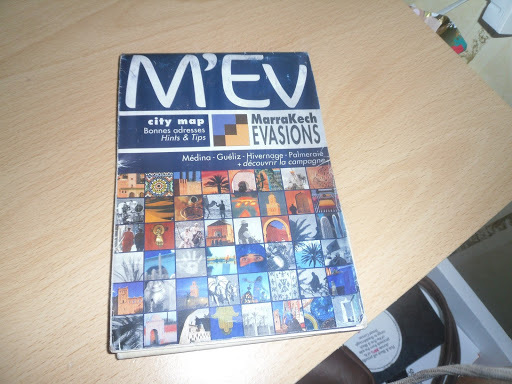 Do a little research, bring a Lonely Planet/guidebook as a basis for the city before going. It can get tiresome very quickly with the combination of heat/chaos and people hassling you. Take a breather: go to a park or a rooftop cafe, have some orange juice and renew yourself so you’re not too hot and bothered. HAGGLE! The shopkeepers always start the price high with the expectation of haggling. Make it friendly/informal, aggression never gets you anywhere. The fresh orange juice is lovely, sweet and plentiful! At 4DH (30p) a glass its something not to miss. Don’t take anything personally. The men can be quite annoying. In essence, the locals are friendly and approachable. Alot of them want your money for everything from directions to guiding you. Be weary, trust your instincts and a firm ‘No’ should stop any excessive hassling.